India Video Surveillance Camera Market (VSC) bagged a Total Shipment of 673,441 Units in CY Q3 2013. The IP segment of the VSCs market registered 28,714 Units led by HIKVISION and DAHUA SECURITY. According to 6Wresearch, India Video Surveillance Camera market recorded a total shipment of 673,441 Units for the CY Q3 2013; representing an increase of 51% to the previous quarter Shipments. CP PLUS with the market share of 24% led the market. Other major players are DAHUA SECURITY, HIKVISION, and MAXIMUS CCTV. DAHUA SECURITY witnessed a substantial growth of 120% and emerged as the fastest growing VSC players in CY Q3 2013 as compared to CY Q1 2013. 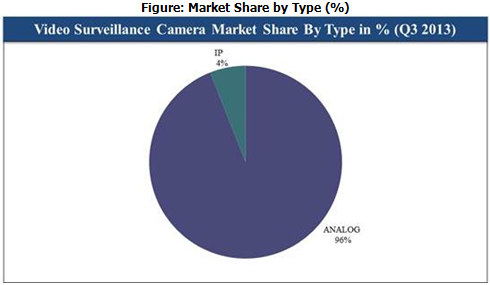 In CY Q3 2013, the market share for analog based Video Surveillance Cameras exhibited an increase of 48% as compared to the previous quarter. The dome shaped cameras account for 67%, whereas the bullet type of cameras account for 31% and the other categories represent 2% of the total market share. Source: 6Wresearch Quarterly India Video Surveillance Camera Market, CY Q3 2013. In CY Q3 2013, IP based VSCs cameras registered a growth of 178% as compared to the previous quarter. Further in the IP camera segment, top three players include HIKVISION, DAHUA SECURITY and BOSCH. Top 3 players collectively account for more than 53% of the total market share. 74% of the total Units Shipped are dome shaped cameras. The PTZ feature is available only in around 3% of the total Units Shipped. ONVIF featured Video Surveillance Camera systems have experienced a substantial increase of around 148%. Further, Video Surveillance Camera systems with memory card support have exhibited a considerable increase of around 60% for the current quarter. However, the video analytics featured VSCs have witnessed a significant increase of 235% in CY Q3 2013 as compared to CY Q2 2013.